In collaboration with the famous designer Philippe Briand, the German boat builders, Lürssen set to work to design "Vitruvius", a super-yacht with unusual characteristics. Thanks to expert advice from Philippe Briand, the design closely resembles that of sailing boats. The hull, in fact, has a classical delta shape, the vertical bow and superstructure almost completely non existent, in flush deck style. Built in Alustar, a more resistant material than aluminium, "Vitruvius" offers excellent navigation comfort, highlighted by a displacement hull, whose l.o.a. is the same as the l.w.l. The careful analysis carried out by the designers aimed at searching the more efficient engine system for this particular hull, mean that sailing performanceand, subsequently consumption, have been optimised. 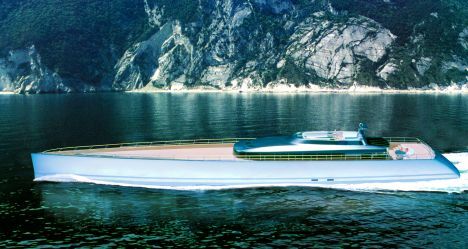 At a speed of 13 knots "Vitruvius" has a range of 4,000 nautical miles, enough to cope with all kinds of oceanic crossings. Furthermore, the low central gravity vertical position, the small displacement and draft, favour comfort no matter what the conditions at sea. In order to keep the centre of gravity at a low position, "Vitruvius" was designed over three bridges, the lower one set aside for sleeping quarters and bathrooms, the deck and flying bridge. On the latter we can find the wheelhouse with 360°visibility across the sea, an option used to give greater visibility when manoeuvring. On deck are those areas specially set aside for open air activities, cushioned sunbathing areas and a swimming pool in the fore area, or the terrace at stern, while inside the superstructure, we can find the other communal areas such as the large lounge. The cabins are arranged along the under deck and can hold eight guests ; in the same area is the large full beam suite for the owner, located in the mainsail area. Separate quarters have been provided for the eleven crew members. Obviously for true intenders, the main play area is still the sea, and this is why "Vitruvius" carries a vast range of specific equipment on board, such as tenders, jet skis, water skis and a laser sailing dinghy, all kept in the garage, whose central door is also used as a beach over the sea. For further information: Lürssen Yachts; Zum Alten Speicher 11; 28759 Brema; Germany; tel. 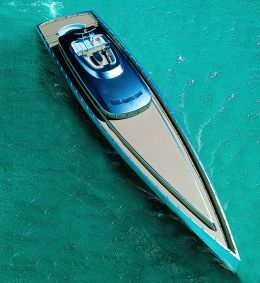 +49 421 6604166; fax +49 421 6604170; web site www.lurssen.com; e mail yachts@lurssen.com. Classification: GL+100 A5 CMCA Motor Yacht + MC AUT.